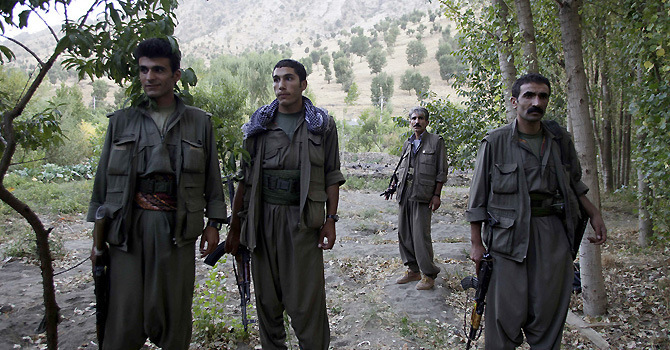 Dispersing doubts little by little, the Kurdish peace process is taking shape as the days go by. The written response of the Kurdistan Workers’ Party (PKK) command in Kandil Mountain to the second letter from Abdullah Öcalan has now been handed over to the Ministry of Justice and the National Intelligence Organization (MİT) for analysis. It is expected to be taken to Öcalan soon by the same Peace and Democracy Party (BDP) delegation that visited him previously. The main point is that the “Kandil command” says “yes” to Öcalan’s suggestion on a “pull-out without weapons” from Turkey to Iraqi soil. No matter how keenly some BDP actors and others attempt to blur that specific point, it seems clear that Kandil has chosen not to challenge Öcalan’s authority. Yet prepare for further fuzzing of the issue from PKK actors, targeted for tactical consumption. There are grounds for this as well: The meeting between the upper levels of the Kandil command signals deep, understandable doubts over how the pull-out process will be arranged, what will happen once the rebels cross into Iraqi Kurdistan and more importantly, how the “mid-level” figures of the PKK’s local units can be persuaded to hide their weaponry. It does not mean though, a big alarm signal for the process — at least, not yet. In an interview with El Pais daily, Murat Karayılan, the PKK’s “chief military executive,” speaks more or less the same language as the lead government circles when he emphasizes its three stages: a) ceasefire/withdrawal; b) full guarantee of rights under the new constitution; and c) “normalization” (disarmament, amnesty, reintegration etc.). It shows that he has “internalized” the rough road map and will abide by it. Let me also note a detail that Nechirvan Barzani, prime minister of Iraq’s Kurdistan Regional Government (KRG) also visited Kandil Mountain, signaling a higher level of KRG engagement. Some further points of significance from the “Kandil command” are: a) The final destination of the entire pull-out will be Iraqi Kurdistan, not Syria; b) As it was expressed by Karayılan, the PKK will “not be on Assad’s side;” c) The peace process is seen in the context of a grand challenge in the entire region, thus as an opportunity; and d) The final farewell to arms is strictly conditional on a full-scale political reform in Turkey. On the home front, the process has a stronger backing compared to three years ago when the “Kurdish opening” collapsed. As recalled in a column by Hüseyin Yayman, a member of the new “wise people” commission, the overall support-opposition in 2009 was 48 vs. 36.4 percent, with 15 percent undecided (Foundation for Political, Economic and Social Research [SETA] figures), but a recent poll by the ANAR research company in mid-March shows 58 vs. 34 percent. The concerns seem to have faded somewhat. Yet in terms of regions, there are three areas where mental resistance is still strong: the Aegean plus Thrace, the Black Sea coast and the Mediterranean strip. Much work is needed there. The noted “flow” of the process, however early and shaky, leaves the political opposition visibly squirming. The leader of the extreme-right Nationalist Movement Party (MHP), Devlet Bahçeli, has now steered solidly to a threatening, escalating rhetoric that sounds tantamount to incitement to violence (whipping up crowds to a frenzy regarding the “wise people,” etc.). It sends out social SOS signals already. Kemal Kılıçdaroğlu seems even more squeezed. He has resorted to a fully negating stand with complaints of the process being non-transparent and saying that “our credit to it is over.” The party is now entrenched, cynically, to re-launch an attack “if things go bad.” That is its current policy. Prime Minister Recep Tayyip Erdoğan seems unmoved. “We will go it alone, no matter how these two behave,” he said yesterday. It will be interesting to see who will emerge as winners and losers from this grand bargain.